As thousands of protesters rallied outside the Bush compound in Kennebunkport, the former and current President Bush (or is it Bushes?) 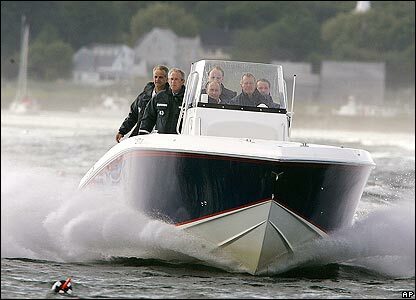 took President Vladimir Putin of Russia for a fishing trip on the senior Bush's boat off the coast of Maine. I sense a Godfather moment; I'm just not sure which one is Fredo. See CNN.com for the lowdown.